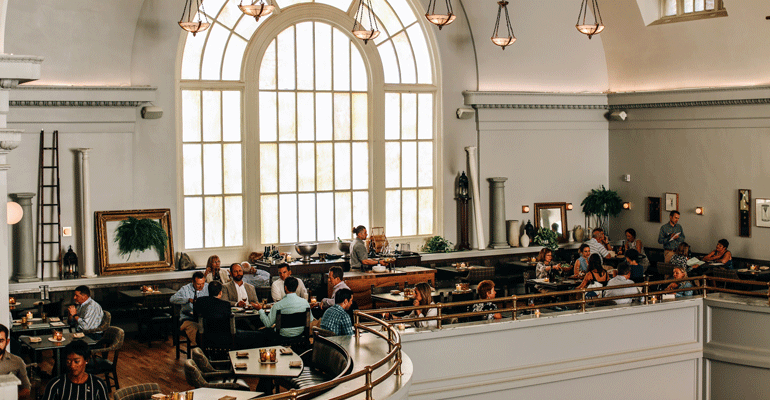 Editor’s Note: Tech Tracker looks at different technologies that are disrupting the industry and changing the way restaurants operate and interact with customers. Through a partnership with online reservation platform Resy, several critically acclaimed and buzzworthy restaurants across the country are hosting “Off Menu Week” throughout the year starting in late February. Off Menu Week was designed as an alternative to traditional restaurant weeks, which occur in various cities throughout the year. Those events typically showcase signature menu items and value-oriented prix fixe meals. Off Menu Week, by contrast, celebrates experimentation and risk. “As diners, we crave connection to the creative people behind our favorite restaurants. We thought, let’s throw out the dated premise of restaurant week and bring to life a program that’s fundamentally about that connection and creativity,” Resy co-founder and CEO Ben Leventhal said in a statement. Restaurants participating from San Francisco to Washington, D.C., include: A Rake’s Progress, helmed by James Beard Award-winning chef Spike Gjerde; modern Japanese robatayaki Tetsu in New York; Lord Stanley in San Francisco; and Pacific Standard Time in Chicago. Joe Manzella’s three TAPS Fish House & Brewery restaurants in Southern California are participating in the inaugural Off Menu Week in the greater Los Angeles area. He said he’s excited to participate alongside other well-regarded restaurants including Chef Antonia Lofaso' Dama and Jewish comfort food restaurant Freedman's. “There are some impressive restaurants involved,” said Manzella, who made the switch from OpenTable to Resy recently. His three TAPS Fish House & Brewery restaurants, known for their Sunday brunch, are featuring entrees that reflect the brand’s roots in delivering premium seafood dishes. He gave Nation’s Restaurant Week a sneak peek at the alt-restaurant week menu, which includes a whole roasted trout served with confit fingerling potatoes, charred greens, bacon lardons and fried capers; Maine Lobster Fritters, Squid Ink Linguine, Blue Crab Baked Oysters and Pan Seared John Dory. 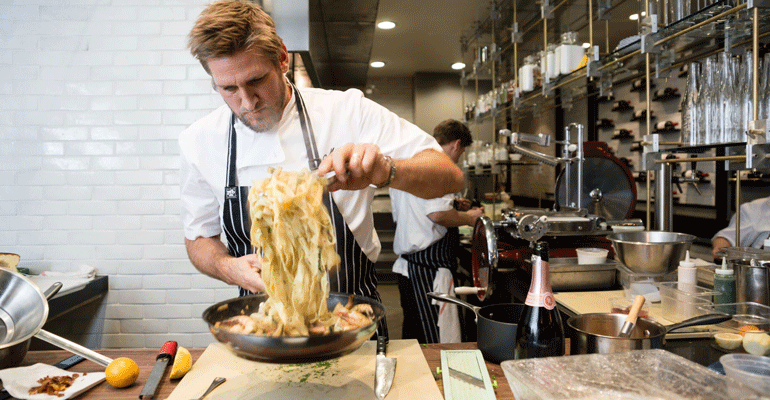 Curtis Stone, chef-owner of the 24-seat Maude in Beverly Hills, said the Off Menu Week gives guests the opportunity try dishes that his culinary team is working on for the upcoming menus. He said Maude is in constant research and development mode as the wine-region inspired menu changes four times a year. 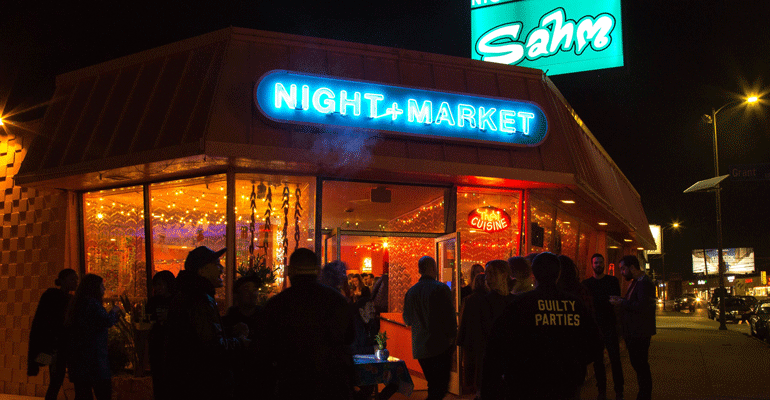 Off Menu Week kicks off Feb. 25 in Los Angeles and runs through March 3. 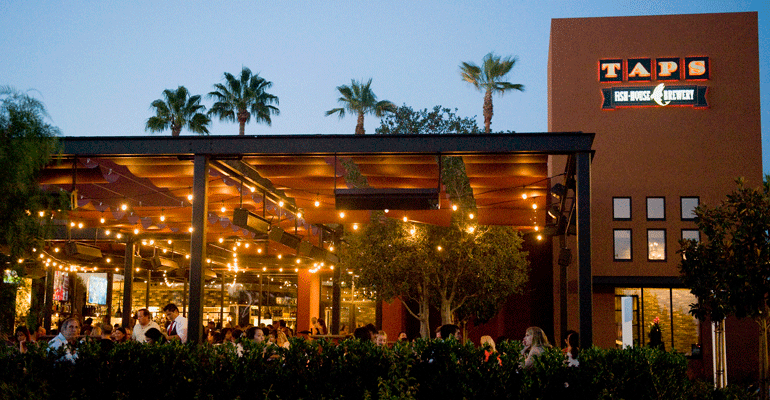 Participating restaurants include in TAPS Fish House & Brewery (Irvine, Corona, and Brea, Calif. locations), Dama, Freedman's, Kismet, Lasa, Maude, Night + Market Sahm, Ronan, Rustic Canyon and Tallula’s. Diners do not have to make a reservation through Resy to participate. April 8-14: Washington, D.C., restaurants participating, so far, include Rake’s Progress, Gravitas, DBGB Kitchen & Bar and The Dabney. June 17-23: San Francisco’s participating restaurants, so far, include Lord Stanley, Protege and Cassava. Sept. 16-22: New York City restaurants include Tetsu, Kings Co Imperial, Aldo Sohm Wine Bar, Air’s Champagne Parlor. Dec. 9-15: Austin, Texas, restaurants booked, so far, include Kemuri Tatsu-Ya and She's Not Here. Oct. 21-27: Chicago restaurants lined up, so far, include Pacific Standard Time and Income Tax. Always a tech innovator in the fast-food space, Domino’s is using artificial intelligence, or AI, in a new rewards scheme. Ahead of the Super Bowl, the chain introduced its new Points for Pies program, which started Feb. 2. The chain said customers can log reward points through its smartphone app by taking a photo of the pizza they’re eating. The twist: It can be any pizza, not just a Domino’s pie. 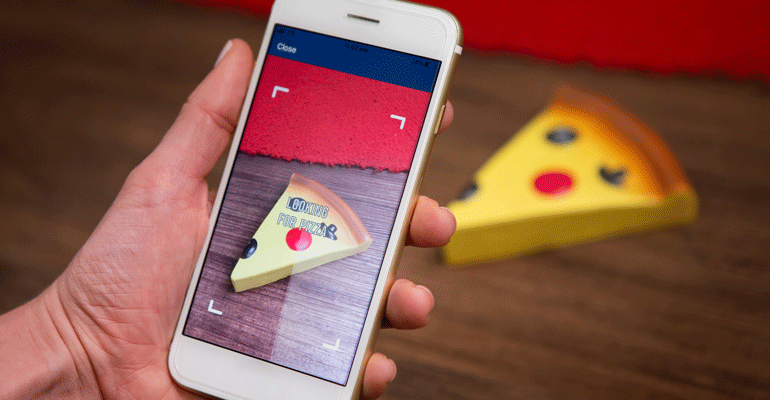 The app contains a newly-embedded pizza identification feature that can recognize any kind of pie – from frozen pizza to a homemade English muffin pizza. "This is the first time Domino's is using AI technology like this," said Dennis Maloney, Domino's chief digital officer, in a statement. “It can even identify if it's a dog's squeaky pizza toy." Customers earn 10 points for each pizza scanned. Once a customer logs 60 reward points, they can swap the points for a free medium two-topping Domino's pizza. But before you buy a dozen frozen pizzas to gobble up in day, please note: customers can only scan one pizza and earn 10 points once a week, Domino’s said. The Points for Pies promotion runs through April 28. “While this rewarded our frequent diners, it was a disincentive for those placing large catering orders,” Capriotti’s said. We told you the Attack of the Food Dropping Drones was coming during our 2019 tech predictions roundup. But to what extent, we didn’t know until now. Market research firm Coherent Market Insights said the global delivery drones’ market is projected to grow 22.3 percent from 2018 to 2026. The firm said demand for drones with higher payload capacity, higher range and increased flight time for delivery of e-commerce products are the key drivers of drone usage growth. One drone developer benefiting from the demand is Flytrex, a Tel Aviv-based logistics company that specializes in consumer goods and food drops by drone. In January, the company received Series B funding of $7.5 million, bringing its total funding raise to $11 million. Flytrex said it will use the funds to scale-up its operations and technology in Iceland and North Dakota, where it has been testing meal and e-commerce drops. In North Dakota, Flytrex drones are delivering snacks and drinks to golfers at King’s Walk Golf Course. Flytrex is also preparing to launch drone delivery this year in North Carolina as part of the U.S. Federal Aviation Authority’s Unmanned Aircraft System Integration Pilot Program. “Drone delivery is taking off, and we are delighted that [new investors] will be joining us in making drone deliveries a global reality,” Flytrex CEO Yariv Bash said in a statement.